Hand Made Amethyst and Sterling Silver Necklace from India, "Lilac Trio"
A trio of amethyst gems grace this design by India's Mahavir. 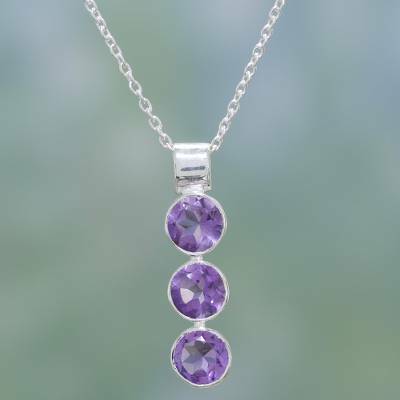 He cuts and polishes the lilac stones before carefully setting them in a stylish sterling silver necklace. I wear this often and like the simplicity of the setting. A great deal of silver jewelry is too "overworked" for my taste. Here, the stones and the setting get equal billing.